Many people have difficulty in sitting the lope. Frequently this is caused by the rider’s lack of experience, although it can also be caused by fear or riding a new horse. First, go back to the trot. 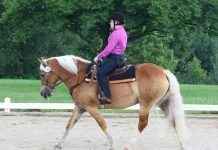 Most riders who have trouble with the lope also try to avoid the fast trot. 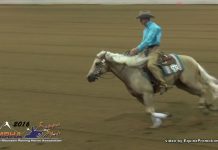 Before you lope, challenge yourself to learn how to post, also known as a rising trot (yes, you can do this in a western saddle). This will force you to face your fear of the potentially choppy gait and improve your feel and timing. Next, take the trot exercise onto a four-leaf clover pattern, four interconnected loops on a square quadrant. Trot the pattern, then break into the lope for one leaf and return to the trot. Practicing this transition while on the pattern will help you focus on your riding and control, which will lead to increased experience and confidence. Another fun tool is the Egg and Spoon I created with Weaver Leather. Balancing it at the lope naturally encourages you to break at the waist and hold your hand steady, exactly what is needed to sit the lope without hanging on your horse’s mouth. This article originally appeared in the June 2012 issue of Horse Illustrated. Click here to subscribe.